“Want me to check my doppler radar?” one of the groomsmen offered. “Oh, yes, please!” responded the concerned bride. According to the weather map, it looked like the rain was supposed to pass in the next 15-minutes, but it was tough to know for sure. If you live in the mountains the unpredictable weather is something you get used to. With a lot of hesitations, the decision was made to execute “Plan B” since the ceremony was due to start and the rain hadn’t yet let up, so the guests all huddled under the overhang of the barn to watch the couple exchange their wedding vows. Britney & Blake were completely in sync as they shared heartfelt sentiments and declared their love for one another in front of their closest family and friends. I overheard prior to the ceremony that the vows they wrote for one another were only three words shy from them both writing exactly 175 words each. How sweet is that? I’d say it’s a pretty good sign! 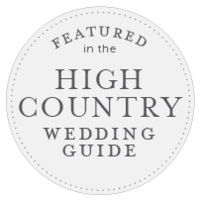 The couple is from the DC area so everything was planned from afar with the help of the folks at the Mast Farm Inn. 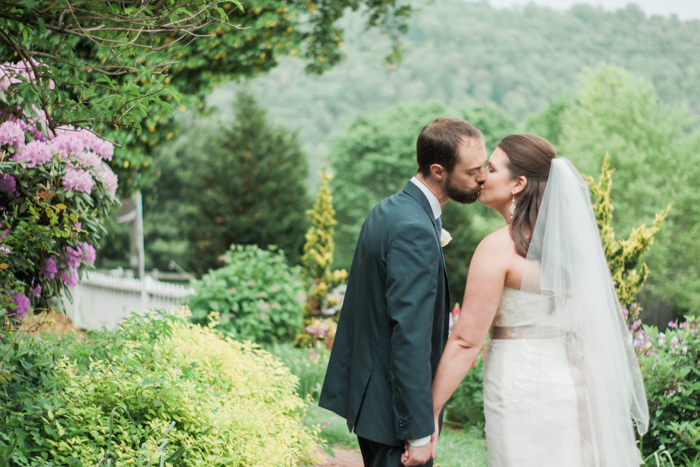 It was such a fitting venue for the look and feel Britney was going for.She dreamed of getting married in the mountains because they love this area, and they chose Mast Farm Inn because of their five-star food and picturesque location! Having fun and getting married in the mountains was one of their main priorities and they couldn’t have chosen a better place to do it. The beautifully decorated tablescapes were adorned with a mix of wooden candlesticks that were handcrafted by the bride’s father, glass candle holders, and cream colored hydrangea clusters that were trimmed with burlap and lace details. I knew that Britney and Blake’s wedding day was going to be relaxed and casual because when Britney and I spoke on the phone numerous times over the past few months we connected pretty easily. It was completely unexpected when Blake eagerly asked, “So, what look and feel are we going for in this shot?” Sure, he was a little reluctant at the beginning when we photographed their charming first look, but it was only a matter of time before he got into it. He might not admit it, but I think he actually had fun posing for the camera with his gorgeous bride! Despite the short bursts of rain they experienced on their wedding day, Britney and Blake took it all in stride, and still enjoyed a fun-filled celebration full of love and laughter! CONGRATULATIONS to Britney + Blake! You’re MARRIED! YAYAYAYAYAYAY! I wish you two newlyweds a lifetime of epic adventures and I hope that your marriage will only grow stronger as you continue this journey together! « Headshots for Hot Shots — Mini Sessions for Business Owners, Seniors, Musicians, & More!